Bengaluru: Congress president Rahul Gandh i is the brain behind the signing of an agreement between the Congress and Janata Dal (secular) for smooth functioning of the coalition government in Karnataka. This is, perhaps, for the first time in the history of coalition government in the state that an agreement has been signed between the partners to leave no scope for misunderstanding. No such agreement was signed between the partners in the Congress-JDS coalition government of 2004 or the BJP-JDS government of 2006.
âIt was Rahul-jiâs idea to have an agreement between the Congress and JD(S). He discussed it with JD(S) supremo H.D. Deve Gowda this morning and he had no problem with the idea. I have signed the agreement on behalf of the Congress party, and Kunwar Danish Ali, secretary-general of JD(S) has signed on behalf of his party,â AICC General Secretary in-charge of Karnataka affairs K C Venugopal told Deccan Chronicle. âIt is just a two-page agreement to ensure a clear road- map for the next five years. It is basically a document to have better understanding between the two parties and see that the government functions well without any misunderstanding or mistrust. The four points mentioned were acceptable to both coalition partners,â he explained. Mr Venugopal said the Congress president decided to give away the Finance portfolio after discussing the matter with Chief Minister H D Kumaraswamy. While Congress leaders like Ghulam Nabi Azad, Ashok Gehlot and Ahmed Patel had held a series of meetings on the sharing portfolios over the last ten days, Mr Gandhi was in regular touch with him to see how things were shaping up, he revealed. âWhat Rahul-ji wants is a close bond with the JD(S) keeping in view the 2019 Lok Sabha polls. 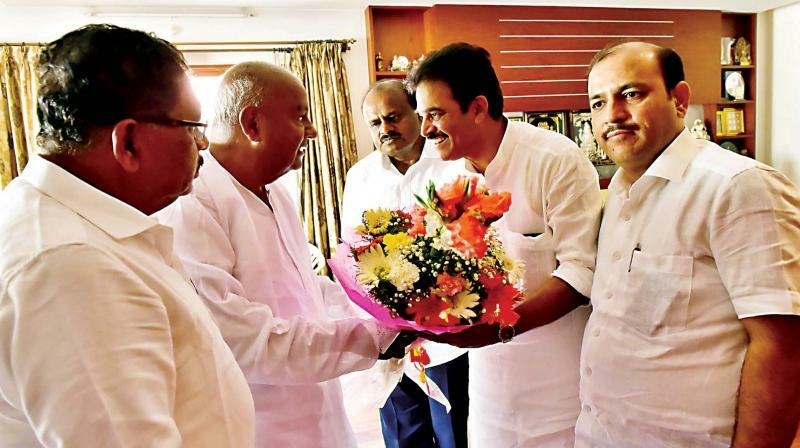 Initially, there were teething problems over the sharing of portfolios but everything has now been resolved amicably in the broader interest of Karnataka and the coming Lok Sabha elections,â Mr Venugopal said. Admitting that talks between the two parties had stopped for one or two days , he said they had resumed thanks to Mr Gandhiâs intervention. On the sharing of portfolios, Mr Venugopal noted that some major ones like Revenue, Water Resources, Social Welfare and Major Industries were still with the Congress. âThere is no question of being happy or unhappy as the goal of both the coalition partners is to give good governance for the next five years,â he added. In an interesting move, Chief Minister, H.D. Kumaraswamy has issued an order to bureaucrats not to bring mobile phones to meetings presided over by him. An order to this effect was signed by Mr Kumaraswamy on May 30. In the memo sent to chief secretary, K. Ratna Prabha, Mr Kumaraswamy said that the officials attending meetings with the CM were found using mobile phones during the meetings. Use of mobile phone s would disrupt the meetings and deliberations thus causing a negative impact. âTherefore, in future, officials who attend meetings convened by the Chief Minister should not bring mobile phones. In case they bring them, they should hand over the phones to co-ordinators of the meeting. After the meeting, the mobile phones can be taken back. This will help to have a fruitful meeting,â the memo said. Meanwhile, a senior officer on the condition of anonymity, said that this was nothing but an order to prevent the officials from recording the deliberations with the Chief Minister. âOf late, mobile phones with cameras are being used to record the proceedings without permission. Contentious oral orders given by the CM can be recorded and later leaked to the media. To avoid this, the government has resorted to this new technique,â sources said.